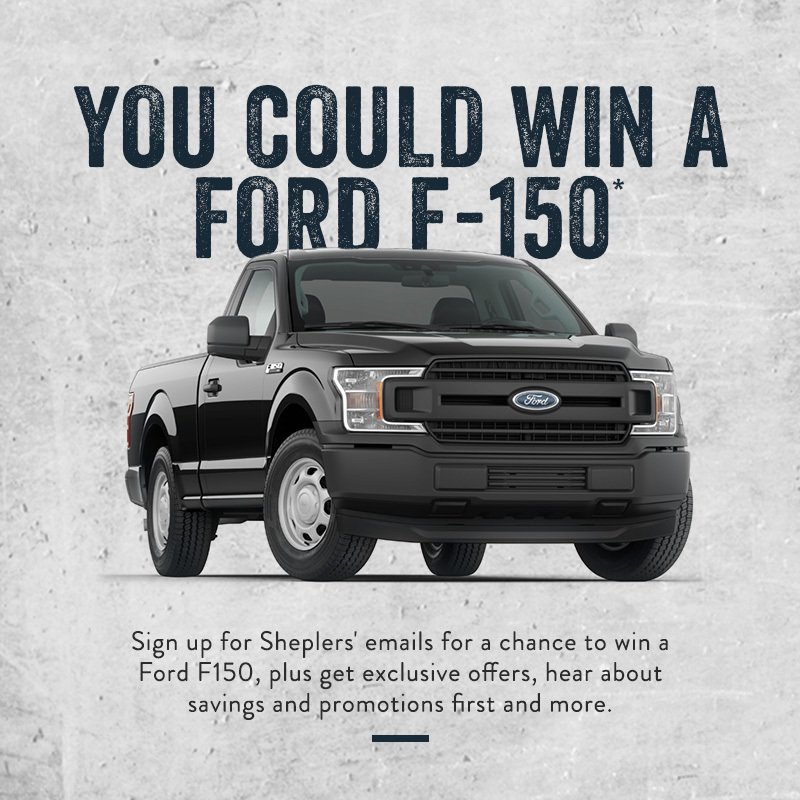 Enter by 9/30 for a chance to win a Ford F-150 Truck! NO PURCHASE NECESSARY. Open to legal U.S. citizens; 18+ at time of entry. VOID WHERE PROHIBITED. Ends 09/30/19. Sponsor: Boot Barn, Inc. The “Sheplers Truck” Sweepstakes (the “Sweepstakes”) is intended for legal residents of the United States and shall only be construed and evaluated according to U.S. law. SPONSOR/ADMINISTRATOR: The Sweepstakes is sponsored by Boot Barn, Inc., 15345 Barranca Parkway, Irvine, CA 92618 (the “Sponsor”) and administered by American Sweepstakes & Promotion Co., Inc., 300 State St. Suite 402 Rochester, NY 14614 (the “Administrator”). ELIGIBILITY: The Sweepstakes is open to legal residents of the United States of America who are at least eighteen (18) years of age or the age of majority, whichever is older, in their respective states of permanent residence at the time of entry (the “Entrants”). Employees, officers and representatives of the Sponsor, the Administrator, their respective parent companies, employees, officers, directors, subsidiaries, affiliates, distributors, sales representatives and advertising and promotional agencies, and the officers, directors, agents, and employees of each of the foregoing, and members of their immediate families (defined as including spouse, biological, adoptive and step-parents, grandparents, siblings, children and grandchildren, and each of their respective spouses, regardless of where they reside) or households (whether related or not) of any of the above (collectively, the “Released Parties”) are NOT eligible to participate in this Sweepstakes. Non-eligibility or non-compliance with any of these Official Rules will result in disqualification. Void in Puerto Rico, U.S. territories, and where prohibited or restricted by law. (For the avoidance of doubt, any references in these Rules to Entrants shall also include the Entrant who is deemed the Winner (as defined below)). Join/Opt into the sheplers.com email list. Complete the Sweepstakes registration form available at www.sheplers.com/winatruck.html (the “Website”).The registration form which will request each Entrant’s full name, complete mailing address, phone number, and email address. GENERAL CONDITIONS: If for any reason the operation or administration of this Sweepstakes is impaired or incapable of running as planned for any reason, including but not limited to (i) infection by computer virus, bugs; (ii) tampering, unauthorized intervention; (iii) fraud; (iv) technical failures or (v) any other causes beyond the control of the Sponsor which corrupt or affect the administration, security, fairness, integrity or proper conduct of this Sweepstakes, the Sponsor reserves the right at its sole discretion, to disqualify any individual who tampers with the entry process, and to cancel, terminate, modify or suspend the Sweepstakes in whole or in part, at any time, without notice and award the Grand Prize (defined below) using all non-suspect eligible entries received as of, or after (if applicable) this cancellation, termination, modification or suspension date, or in any manner that is fair and equitable and best conforms to the spirit of these Official Rules. Sponsor reserves the right, at its sole discretion, to disqualify any individual deemed to be tampering or attempting to tamper with the entry process or the operation of the Sweepstakes or Sponsor’s Website; or acting in violation of these Official Rules or in an unsportsmanlike or disruptive manner. CAUTION: ANY ATTEMPT TO DELIBERATELY DAMAGE ANY WEBSITE OR UNDERMINE THE LEGITIMATE OPERATION OF THE SWEEPSTAKES IS A VIOLATION OF CRIMINAL AND CIVIL LAWS AND SHOULD SUCH AN ATTEMPT BE MADE, THE SPONSOR RESERVES THE RIGHT TO SEEK DAMAGES OR OTHER REMEDIES FROM ANY SUCH PERSON (S) RESPONSIBLE FOR THE ATTEMPT TO THE FULLEST EXTENT PERMITTED BY LAW. Failure by the Sponsor to enforce any provision of these Official Rules shall not constitute a waiver of that provision. RELEASE AND LIMITATIONS OF LIABILITY: By participating in the Sweepstakes, Entrants agree to release and hold harmless the Released Parties from and against any claim or cause of action arising out of participation in the Sweepstakes or receipt or use of any Prize, including, but not limited to: (i) any technical errors that may prevent an Entrant from submitting an entry; (ii) unauthorized human intervention in the Sweepstakes; (iii) printing errors; (iv) errors in the administration of the Sweepstakes or the processing of entries; or (v) injury, death, or damage to persons or property which may be caused, directly or indirectly, in whole or in part, from Entrant’s participation in the Sweepstakes or receipt of any Prize. Released Parties assume no responsibility for any error, omission, interruption, deletion, defect, delay in operation or transmission, communications line failure, theft or destruction or unauthorized access to, or alteration of, entries. Released Parties are not responsible for any problems or technical malfunction of any telephone network or telephone lines, computer online systems, servers, or providers, computer equipment, software, failure of any email or entry to be received by Sponsor on account of technical problems, human error or traffic congestion on the Internet or at any website, or any combination thereof, including any injury or damage to Entrant's or any other person's computer relating to or resulting from participation in this Sweepstakes or downloading any materials in this Sweepstakes. Entrant further agrees that in any cause of action, the Released Parties’ liability will be limited to the cost of entering and participating in the Sweepstakes, and in no event shall the Released Parties be liable for attorney fees. Entrant waives the right to claim any damages whatsoever, including, but not limited to, punitive, consequential, direct, or indirect damages. DRAWING AND NOTIFICATION: The potential Grand Prize Winner will be selected in a random drawing from among all eligible entries received. The Grand Prize drawing will be conducted by the Administrator, whose decisions are final and binding. The Prize drawing will be conducted on or about October 5, 2019. The potential Winner will be contacted by the Sponsor (or Administrator) via phone, email and/or by USPS mail. Odds of winning the Grand Prize will depend on the total number of eligible entries received throughout the Sweepstakes Period. GRAND PRIZE: There will be one (1) Grand Prize Winner. The Grand Prize Winner (“Winner”), upon the Administrator’s confirmation of eligibility, will receive a 3-year lease of a Ford F-150 (awarded as one (1) $12,000 check) (“Prize” or “Grand Prize”). All other expenses associated with Prize acceptance or usage not specifically mentioned herein are the responsibility of the Winner. NOTE: Substitution, assignment or transfer of the Prize is not permitted, except by Sponsor, who reserves the right to substitute the Prize with another of equal or greater value. PRIZE CONDITIONS: By accepting the Grand Prize, the Winner agrees to release and hold harmless the Released Parties, each of their related companies, and each of their respective officers, directors, employees, shareholders, and agents from and against any claim or cause of action arising out of participation in the Sweepstakes or receipt or use of the Prize. The potential Grand Prize Winner will be notified by home-delivered mail, phone, or email, and must sign and return to the Administrator, within five (5) days of the date of notice or attempted notice is sent, an Affidavit of Eligibility, Liability & Publicity Release in order to claim the Prize. The Winner may also be asked to complete an IRS Form W9. Note: The Affidavit sent to a potential Winner will require that the Winner provide their Social Security Number to the Administrator, which will be used solely for tax reporting purposes. The Grand Prize Winner is responsible for all local, state, and federal taxes associated with the receipt of the Prize. The Winner must note that the value of their accepted Prize is taxable as income and an IRS Form 1099 will be filed in the name of the Winner for the value of the Prize, and the Winner is solely responsible for all matters relating to the Prize after it is awarded. If a Prize or Prize notification is returned as unclaimed or undeliverable to a potential Winner, if a potential Winner cannot be reached or does not reply as directed within two (2) days from the first notification attempt, or if a potential Winner fails to return requisite document(s) within the specified time period, or if a potential Winner is not in compliance with these Official Rules, then such person shall be disqualified and, at Sponsor’s sole discretion, an alternate Winner may be selected. By accepting the Grand Prize, where permitted by law, the Winner grants to the Released Parties and those acting pursuant to the authority of Sponsor and the Released Parties (which grant will be confirmed in writing upon Sponsor’s request), the right to print, publish, broadcast and use worldwide IN ALL MEDIA without limitation at any time their full name, portrait, picture or video, voice, likeness and/or biographical information for advertising, trade and promotional purposes without further payment or additional consideration, and without review, approval or notification. DISPUTES: By entering the Sweepstakes, Entrants agree that i) Any and all disputes, claims, and causes of action arising out of or connected with the Sweepstakes, or any Prize awarded, shall be resolved individually, without resort to any form of class action; ii) Any and all claims, judgments and awards shall be limited to actual out-of-pocket costs incurred, including costs associated with entering the Sweepstakes but in no event attorney fees and iii) Under no circumstances will any Entrant be permitted to obtain any award for, and Entrant hereby waives all rights to claim, punitive, incidental or consequential damages and any and all rights to have damages multiplied or otherwise increased and any other damages, other than for actual out-of-pocket expenses. All issues and questions concerning the construction, validity, interpretation and enforceability of these Official Rules, or the rights and obligations of the Entrants and Sponsor or the Released Parties in connection with the Sweepstakes, shall be governed by, and construed in accordance with United States law. Any legal proceedings arising out of this Sweepstakes or relating to these Official Rules shall be instituted only in the federal or state courts of California, and the parties consent to jurisdiction therein with respect to any legal proceedings or disputes of whatever nature arising under or relating to these Official Rules. The invalidity or unenforceability of any provision of these Official Rules shall not affect the validity or enforceability of any other provision. In the event that any provision is determined to be invalid or otherwise unenforceable or illegal, these Official Rules shall otherwise remain in effect and be construed in accordance with their terms as if the invalid or illegal provision were not contained herein. WINNERS LIST REQUEST: To request confirmation of the name, city, and state of residence of the Winner, please send a self-addressed, stamped business size envelope, by November 30, 2019, to: ASC/Boot Barn “Sheplers Truck” Sweepstakes Winners List Request, 300 State St., Suite 402, Rochester, NY 14614.